3. The Source File for the variable data is listed just below the Dataset. To set the source file, click the ... button. This displays the Open dialog. 4. Navigate to the correct folder and click on the variable data file name. 5. Click Open. 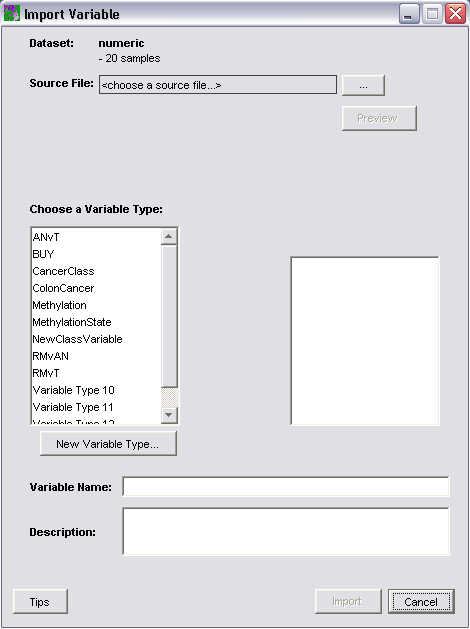 The source file name is displayed on the Import Variables dialog and the number of observations in the file is listed. The number of observations in the file must match the number of samples in the dataset. If there are existing variable types, GeneLinker™ compares the classes in the new variable file to the classes of the existing types. If the classes are contained within an existing variable type, a message is displayed indicating this. To preview the contents of the new variable file, click the Preview button. The Import Variable preview dialog is displayed. The class entries in the file are displayed under the Preview heading in the order they exist in the file. The scrollbar can be used to look through the entire list. Click OK to return to the Import Variables dialog. The 'unknown' class is automatically added to all new variable types. It will be listed on the Import Variables dialog. 6. Click Import. The variable data is imported into the database, and in the Experiments navigator, the dataset icon is marked with the variable tag ( for a complete dataset or for an incomplete dataset).